The colourful DECLARATION OF VINTAGE took place on Sunday 18 February 2018. Daniel Falkenberg, of Eden Hall Wines, was named Barossa Viticulturist of the Year and Richard Langford, winemaker at Elderton Wines, was named the 2018 Barossa Winemaker of the Year. James Rosenzweig, Rosenvale Wines, was presented the BGWA Services to Industry Award by Nicki Robins. A plaque in the name of Brian Hurn OAM was unveiled by his family and will be placed in the footpath alongside Keil Garden in Tanunda. We welcome and toast our new Barons! 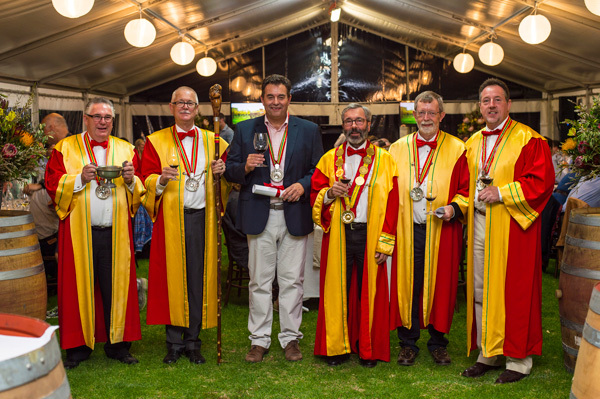 Five members of the Barossa Wine community were inducted as Barons of Barossa at The Barossa Cellar Grand Dinner held at Chateau Tanunda on Thursday evening 20th of April. The new Barons include winemaker Shavaughan Wells; winemaker Julie Ashmead; educator, viticulturist and winemaker Trevor March; viticulturist and winemaker Rob Gibson; and Co-Managing Director of Elderton Wines Cameron Ashmead. Shavaughan Wells has been making wines at Saltram Wines since 2005 and was recognized for her outstanding contribution to the profile of the Barossa. It was a big night for the Elderton team with Julie and Cameron both being inducted. Julie is part of the famous Campbells of Rutherglen dynasty which has been making wine since 1869. Cameron has served the community firstly as board member and chairman of the Barossa Co-op, board member of Foundation Barossa. Rob worked as a winemaker at Penfolds for 22 years before setting up Gibson Wines and his own international consultancy in 1987. Trevor is another Barossa veteran who established the Wine Industry Training program for TAFESA before re-establishing winemaking at his historic Heathvale property. Grand Master, Stephen Henschke, highlighted the accomplishments of the new Barons. “We have invited these five people into the Fraternity in recognition of their significant contributions to the Barossa, both in the wine industry and in support of the greater community,” he said. 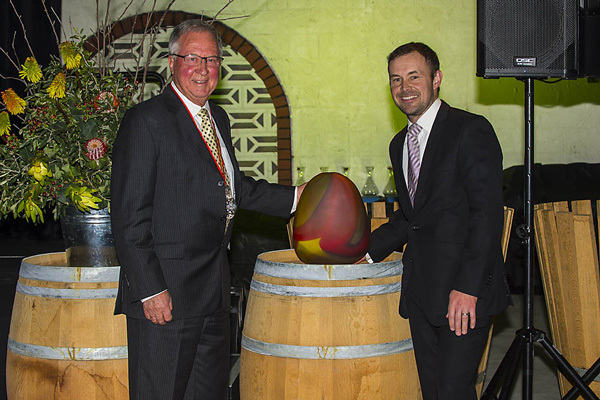 The Barons of Barossa Trophy, The Chairman's Selection for The Barossa Cellar was awarded to Ian Hongell, Head Winemaker, Peter Lehmann Wines. The winning wine was the 2014 VSV Valley View Shiraz and was chosen by the Chairman of Judges as having the best aging potential. A parcel of this wine will be cellared in The Barossa Cellar. Ian accepted the Trophy which was a hand crafted block of mosaic glass depicting the Barossa Ranges. The much anticipated Learning Resources Package was launched at Tasting Australia on Saturday May 7 in the Food Village, Victoria Square Adelaide. This day 12 months ago we were here looking towards vintage 2015. It looked like it would be pretty good - we had had some rain, and the healthy vines were moving along quickly. Steve Lienert is Barossa born and bred. He was immersed in "wine country" and fast became an oenophile and followed his father into the wine industry in 1978. Baron Aaron Penley (L) presents the Barons Trophy to winning winemaker Andrew Quin, Hentley Farm. The Trophy was produced at the Jam Factory Seppeltsfield and is hand blown glass. The Barons of Barossa induct Dr Josef (Pepi) Schuller MV into the Wine Fraternity, Barons of Barossa. From L Barons Grant Burge and Mal Whyatt, Dr Josef Schuller and now Baron, Grand Master Stephen Henschke and Barons Colin Glaetzer and Peter John.